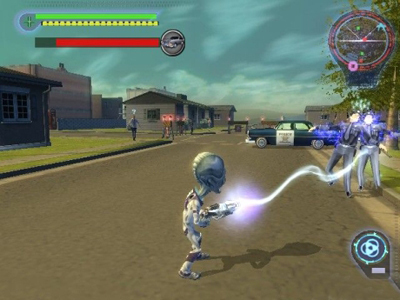 We've been following the progress of Destroy All Humans! pretty closely since we saw it at E3 and got an even closer view just a few months ago. With the game being developed by Pandemic Studios, the folks behind Star Wars: Battlefront and the upcoming Mercenaries, our hopes are even higher. So it was a bit of an afternoon delight when a new demo with three levels was shown at our office today. It was hard work, but we got some more hands-on time and had the chance to make many more movies. The general story of Destroy All Humans! involves Cryptosporidium-137 (C-137), a short alien with a huge head, as he adventures to Earth in search of his predecessor, Cryptosporidium-136. C-137 is helped along the way by aliens on the mothership, but the work is all his. He has to do everything on foot or by UFO and there are many tools to help him in his task. We've discussed the various weapons before such as the Zap-o-Matic and the telekinesis powers, but there were a few new details here. While the Zap-o-Matic, a gun that shoots lightning, can kill humans with prolonged bursts it can also be used to wipe their memory as well and leave them in a dizzy state for a few seconds. This helps for avoiding attention and making sure that someone won't call an alarm from one sighting. The weapons also advance in power during the course of the game so it's especially important in the early levels to just go for the quick dizzy shot than stick around for the full execution. Advancing the weapons in the game is a matter of collecting missing probes that are scattered around the levels. Aliens love the probe and by bringing them back to the mothership C-137 can purchase upgrades to his weapons. Once a level has been completed the first time, C-137 can always go back later to get all of the objects as well as complete any other side quests that were passed the first time through. Other things can be upgraded a well such as C-137's telekinetic powers, but these require some serious brains. Not like intellectual power, but a large supply of brains that have been grabbed from the dead humans. Way back in the day some aliens hooked up with some humans and now there is a little bit of alien DNA in all of the humans. So by taking all the brain stems it's possible that the aliens can improve themselves. This gives more incentive to do what the title says and destroy all the humans. While the telekinetic power before looked like a cool party trick the new level that was shown featured a new use for it. A black car is driving around a suburban town and it's up to C-137 to take it out. It's possible to run after it, guns a blazing, but there's an even sneakier way that is a little slower, but safer. By copying the look of a nearby human and putting up a hologram of him over himself, C-137 is able to wander the streets safely. Without any weapons to use, C-137 can still use his telekinetic powers. Fortunately, outdoor grills are popular and there are lots of propane tanks around. By picking them up and throwing them at the car, the target is easily taken out. Aside from these new details, the rest of the changes in the game are much smaller and are really there to help polish the game. Destroy All Humans! is still pre-alpha so there are many more developments that are in store for it. 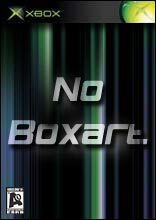 What we can see now is the main structure for the game as well as an insight into its own sense of humor which is looking to be perfectly skewed and bizarre. To get a better understanding of what the game is looking to be right now, head over to the Media Page to check out the new movies. There are 10 new videos to check out that feature all sorts of wanton destruction and propane throwing.